Room 2 have been doing fantastic learning over the last few weeks! 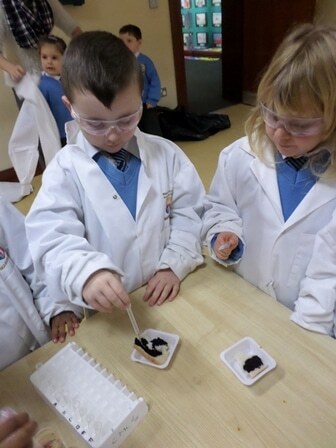 They became scientists and carried out lots of tests on different foods during Science week. They have also been learning all about their five senses and had a taste test in their class this week with different foods that were sweet, salty, bitter and sour. Which do you thing they liked best? The children in Room 2 LOVE animals- especially their pet fish Sophie and Loveheart, whom they are taking great care of! They set up their own Pet Shop in their class, and have been acting as shopkeeper and customers over the last month, buying and selling lots of different animals, using money. They have also been learning about different types of animals and their homes, and have been building Old MacDonald’s farm animals new homes using their construction blocks during play time. Room 2 have also been learning about how different animals care for their young, and how some of them hibernate in Winter. They loved playing the different animal characters in ‘The Gruffalo’ story, and had so much fun reading the story in class, on their Story Wall, and using their story wheels. Room 2 have also been singing their ‘Gruffalo song‘ in Music, and became music conductors, directing each other to use high, middle, and low pitch voices. They have been acting out the story with masks too, and made their own fantastic Gruffalo puppets in art using lots of different fabric and fibre materials. Does this bread have starch in it? How do you know?